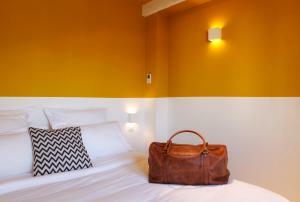 Hotel Du Haut Marais is located in Paris’s famous Marais neighbourhood 800 metres from Place de la République. It offers en suite rooms and free Wi-Fi. 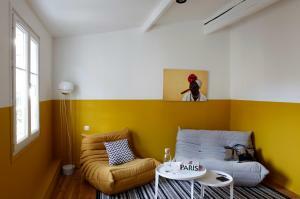 Rooms at Hotel Du Haut Marais are equipped with a telephone, TV and private bathroom. The rooms are lift -accessible. Hotel Du Haut Marais is a 3-minute walk from Arts et Métiers Metro (lines 3 and 11) and a 6-minute walk from Réaumur – Sébastopol Metro (lines 3 and 4). Featuring a flat-screen TV and iPad with a virtual concierge service, this room has a Nespresso machine and tea at your disposal. Rate: € 136.00 ... € 367.50; select dates below to get current rates. Offering courtyard views, this apartment is composed of a bedroom, living room and equipped kitchen. Guests have free access to a minibar, with non-alcoholic drinks. A Nespresso machine and tea are also available at your disposal. 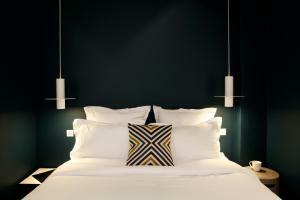 Extras include a flat-screen TV in each room and an iPad with a virtual concierge service. Rate: € 202.11 ... € 278.38; select dates below to get current rates. Situated on the top floor, this loft offers views of Parisian rooftops and is composed of a bedroom, living room and equipped kitchen. Guests have free access to a minibar, with non-alcoholic drinks. A Nespresso machine and tea are also available at your disposal and extras include a flat-screen TV in each room and an iPad with a virtual concierge service. The loft features an open bathroom fitted with a bath.